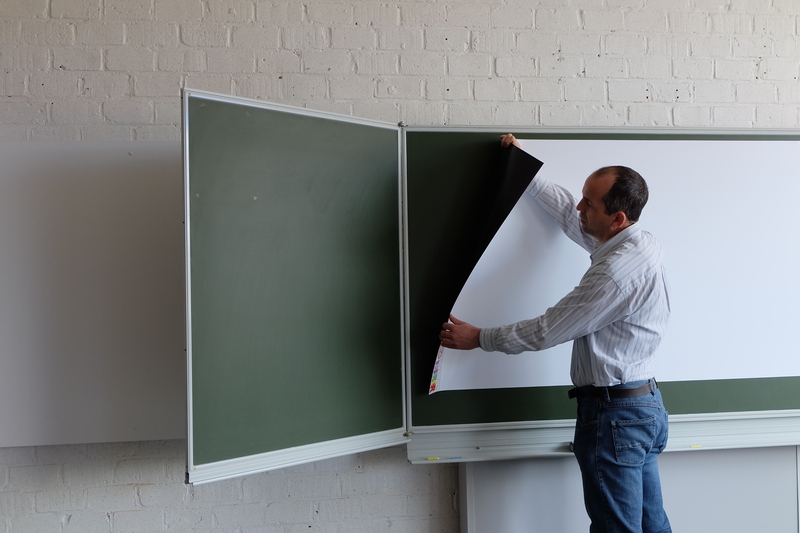 Magnetic projection foil for the most flexible solution for your 'blackboard'. Just like a magnet you stick the foil to the 'blackboard' or whiteboard in seconds, to turn it in the perfect projection surface. The magnetic projection foil is very easy to use and install. It is as simple as sticking a magnet to the board. together with a Vmarker IR-sensor even an interactive whiteboard. You can use this magnetic film also on whiteboard. Whiteboards for dry erase markers or not suitable for projection. With this magnetic film you can give the Whiteboard a perfect projection surface when you need it. Without the annoying reflection of the projector. Just remove the magnetic film when you want to use your drymarkers. With this foil you can have the best writing surface: chalkboard, or whiteboard and the best projection surface. You do not have to compromise. You switch to the best surface for the job in seconds. The projection foil is matt white, ideal for projection. It is not suitable to write on with drymarker.